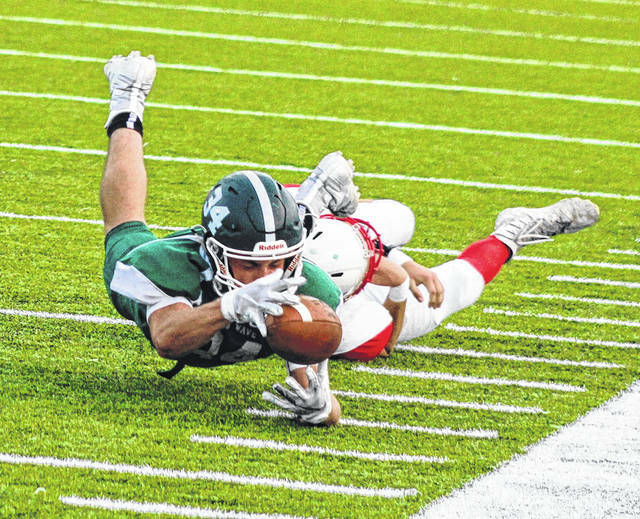 Greenville’s Landon Eldridge (34) dives forward to get every yard he can in a game earlier this season. Eldridge leads Darke County in rushing with 906 yards and 14 touchdowns. Below is the fifth installment of statistics for the 2018 fall prep sports season. These will run every Friday in The Daily Advocate. Coaches are asked to submit cumulative statistics by 5 p.m. each Wednesday in order to be included in that week’s listing. A PDF of statistics or a link to your online statistics should be emailed to The Daily Advocate sports editor Skip Weaver at sweaver@aimmediamidwest.com. This entry was tagged Ansonia Tigers, Arcanum Trojans, Bradford Railroaders, CCC, Franklin-Monroe Jets, Greenville Green Wave, GWOC, MAC, Mississinawa Valley Blackhawks, Tri-Village Patriots, Versailles Tigers. Bookmark the permalink.